Travel-School 2018-2019 started early this year. Tony’s schedule was to race in the Mediterranean for most of the summer/fall and we love Spain, so we organized our late summer and early fall to be based here. We spent two weeks on Mallorca, followed by four weeks in Valencia. Our primary goal was for the kids to increase their spanish vocabulary and practical knowledge of the country. Sophia has put in a good effort studying spanish over the past four years, so she was ready. Oliver was motivated to learn “Baseball Spanish” and I decided if they were going to take formal classes, then I wanted to do the same! I was nervous and excited for my first day of language school. I felt like a teenager, butterflies and all. I had tested into an intermediate level, which both thrilled and worried me. After all, I learned Spanish years ago, not from school, but self-taught while living in Spain. I speak, read and understand fairly well, but when writing, my grammar is lacking – and at the intermediate level, a higher level of grammar is expected. By enrolling myself in an accredited school, my peers would soon know my secret achilles heel; I was about to expose my language short-comings. Walking through the old town after school. *If curious, Oliver and Sophia were not the least bit nervous for spanish classes. Confounding! Taking on new adventures in combination with real-time life learning, is a trademark of our travel-school. This fall, we attended two different language schools over the course of six weeks in Spain. The first was the International House of Valencia. 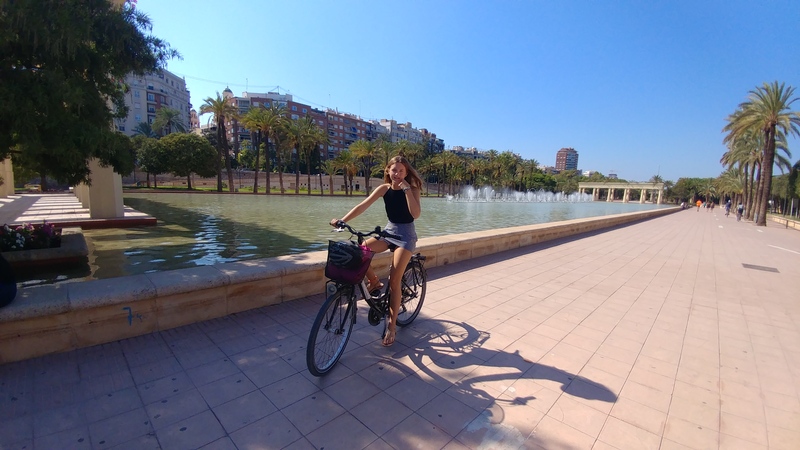 Located near the center of historic Valencia, we had no shortage of things to do when school let out. The school was well run, with excellent teachers. They offered intensive language courses for ages 16 and up, and like most language schools, provided daily opportunities for various cultural excursions. I was enrolled in an intensive group course (total immersion), but because of their ages, Sophia and Oliver had to take private lessons. 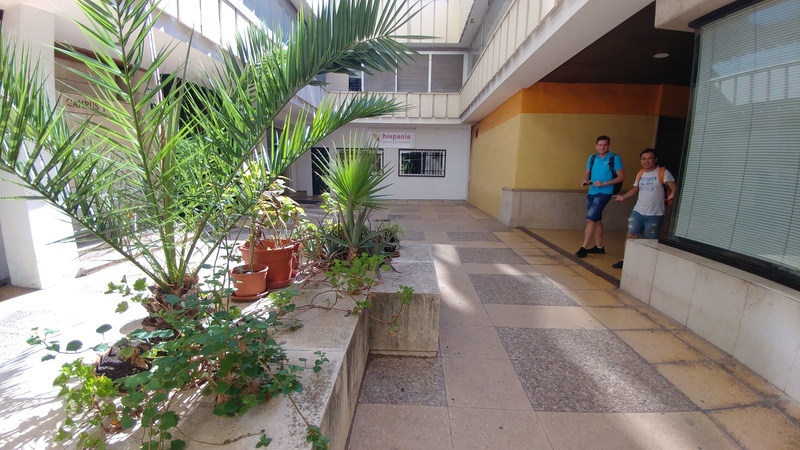 Above is the main courtyard of International House Valencia. Both schools were close to our house. Our daily commute was a nice 20-minute bike ride each way. On our first day of school, after I met Sophia and Oliver’s teacher, I tapped down a flight of stairs to look for my own class. It took about one minute to realize how normal everyone was (no grammar police!) and of course I was in exactly the right course for my spanish level. I was surprised to be the only american in a class of ten students, and fascinated upon learning that Spanish was our only common language. Americans are, after all, a country of immigrants. I loved the classroom format there and we all learned a LOT, but the cost of private lessons was high. Although expensive, it was a good choice to quickly boost our language skills. Sophia and Oliver chatting with a new friend after class at Hispania. 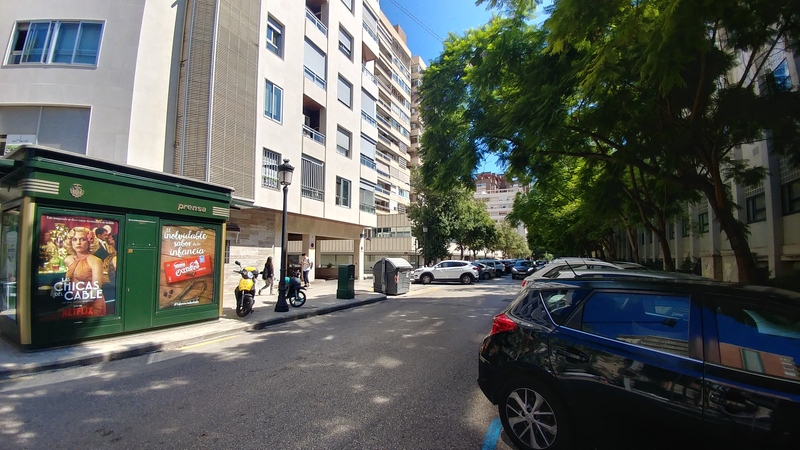 The second school we tried was called Escuela Hispania, situated near a university on the city’s northern side. Sophia and Oliver were welcome to participate in any class, so at Hispania, they had a real “university” experience. Since our classes were in different buildings, I could not check in on them, which was probably a good thing! This school is about half the cost of International House and is also highly rated, winning the prestigious ST STAR Language School Award for the last 4 years in a row. 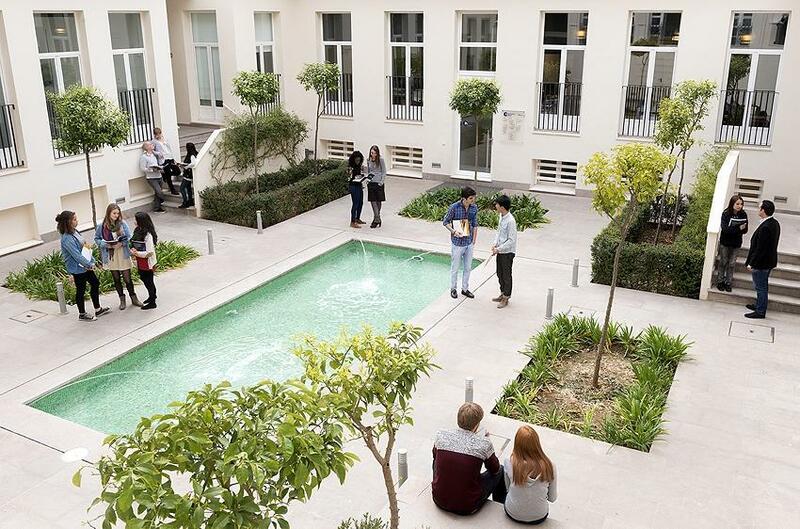 Escuela Hispania has a positive and multi-cultured atmosphere with students from over 80 countries registered annually. We noted very few americans – I think only one actually – and she was from Middletown, RI (*Hola Mary B.!) Great minds think alike. Escuela Hispania has multiple buildings for offices and classrooms. We loved this school and did not want our time there to end. Our classmates and teachers were interesting, supportive, and we miss them already! ¿Por qué español? After years of studying French (a language I was rarely able to use), I feel Spanish is simply more practical. The language is fluid, beautiful, and spoken nearly everywhere. Spanish culture is profoundly passionate, kind, family-oriented and mindful in nature. All things that resonate with me. Also, knowing multiple languages is a real super-power. Since most people around the world (≠ americans) speak AT LEAST two languages, we have to work hard to catch up. Did you know that Spanish is the 2nd most spoken language in the world? (behind #1, Chinese). Did you think it was English? (that would be #3). Above, we are enjoying daily merienda (spanish late afternoon snack), while discussing what we learned during the day. Spaniards are inherently gracious. They appreciate when foreigners make an effort to speak their language. And speaking is absolutely necessary for the learning. One of the great gifts of this particular Spanish city is that it has remained culturally intact – specifically, there is very little english spoken. Sophia and Oliver have no choice but to habla español with friends, in restaurants, etc. Even when it is rough-going, they are communicating and getting better at it every day. Above, we are studying art history after language class (con Tony!) at the Museo des Bellas Arts. 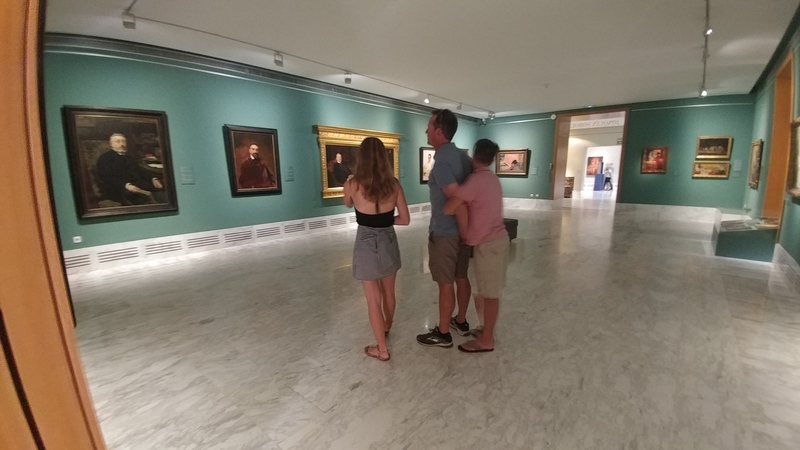 This exhibit included extraordinary portraits by Valencian painter, Joaquín Sorolla. 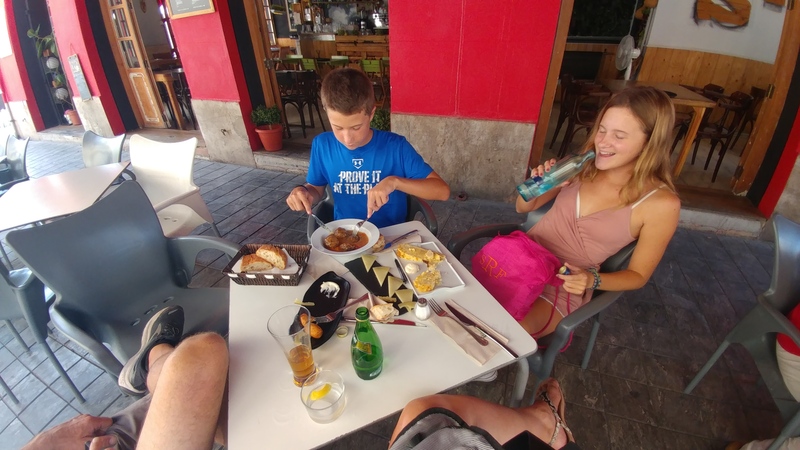 At this time, we are still deeply entrenched in our spanish experience, and continue to appreciate and admire the community, gastronomy and familial culture in Spain. Our spanish is greatly improved and I feel much more confident about my grammar skills. We made it our goal to understand life here, make new friends and of course, try every traditional food we can. Having the ability to speak the language has made travel both easier and more enjoyable. Below are links to the spanish schools in Valencia we attended, though there are many others as well. Most schools will even help organize housing if that is something you might need in order to enroll. Online courses we have used with great success are: DuoLingo, Rosetta Stone and IXL Spanish. With so many options available, there is really no excuse… Dive in to another culture, and learn another language! BRAVO to all of you. especialy You Lynn for having organized such an interesting and fun programSpeaking another language is of course practical when you are living in that country but besides that ,it opens up another world .The Latin languages are I think particularly fun to speak and open up another aspect of ones personality . I know ,in my case, my Italian me is different from my English and French me. Big hugs and abbracci to you all. This is wonderful…we are so jealous! We love Spain, can’t wait to go again, and so wish we worked harder on our Spanish. This is inspiring.